Im glad we post photos. This curiously fashioned CD player calls to mind what I had assumed was an old Chinese adage. Fred R. Barnard, an advertising man, coined "One picture is worth a thousand words" in 1927, calling his bon mot "a Chinese proverb, so that people would take it seriously." 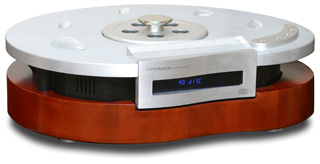 The Consonance Droplet CDP5.0 ($3000 USD) really is Chinese. The manufacturer, Opera Audio Co., Ltd., is headquartered in Beijing. To remain with clichés, the Droplets built like a battle tank. Its astonishingly thick aluminum topside could probably deter all but an armor-piercing round. Ive the creeping, not-so-original suspicion that Chinese audio components, at least in terms of materials and finish, are putting American, European, and even Japanese manufacturers on their mettle. I just read Ken Chois Ultra Audio review of the Qinpu A-8000 Mk II integrated amplifier. Again, ample metal and attractive wood at a relatively modest price. The Droplets features are minimal. For example, theres no left/right channel balance, but it does have a volume control, which brings me to a problem. Being till recently without a preamp, Ive been using and reviewing CD players with volume controls: Mark Levinson No.390S, Wadia 861se, and Aurum Acoustics Integris CDP. The Droplets manual recommends balanced interconnects for a smidgen less noise and distortion. My Levinson No.33H amps produce 26.8dB of voltage gain. With a pair of balanced Nordost Valhalla ICs connecting the player directly to the amps, I can set the Droplets volume no higher than "1" in a range of "0" (silence) to "50." Even at 1, many discs played louder than I prefer. Not an insurmountable obstacle. The Droplet employs true-differential circuitry. With balanced ICs, the output is given at 4.6V RMS; with single-ended, 2.3V RMS. Obviously, operating the Droplet directly into these power amps -- no others were on hand -- I was obliged to check out the players compatibility with single-ended (RCA) ICs, on loan from Marc Mickelson: JPS Labs Superconductor 2s. They provide plenty of volume flexibility. I did a fair amount of listening with the single-ended ICs and returned to the balanced Valhallas in order to judge the Droplets sound in the system Im accustomed to. I also listened by way of the line-level preamp section of the Aurum Integris CDP, which has joined my system as a permanent resident. For this setup, the Isoclean Super Focus power cord remained with the Integris, with an Acoustic Zen Gargantua II power cord feeding the Droplet. A pair of Nordost Valkyrjas -- balanced ICs close in characteristics to my reference Nordost Valhallas -- linked the Droplet to the Integris. I set the Droplets volume to maximum and adjusted for volume by way of the Integris. More about this farther along. Speakers, by the way, were Wilson Audio WATT/Puppy 7s. To remain for a moment with volume, my longtime reference player, a Mark Levinson No.390S, also features a true-differential circuit and posts similar output figures: balanced, 4.45V; single-ended, 2.225V. I generally listen at around the middle of the No.390Ss range, which gives me ample room for adjustment in either direction. I discussed this with Steve Monte of Nat Distribution, Opera Audios US distributor. Hes heard of the problem with some solid-state gear, but added that with many solid-state and probably all tubed amps, the Droplets volume range operates normally. If, like me, you use high-gain amplification to which the Droplet directly connects, remember to put the amp or amps into standby before you turn the player off. The pop my speakers emitted sounded like pistol shots. I actually checked to see whether Id trashed a tweeter or two. Whatever produced that bang -- excess DC offset at the output? -- was perhaps peculiar to my review unit. Steve Monte tells me that this is the first hes heard of it. Still, I advise caution. Talk about unique! Quite apart from its kidney-bean-from-outer-space silhouette, the Droplet arrived accompanied by five glass baubles, in various sizes, that resembled shiny little puddles -- droplets in repose. The manual I downloaded from the Internet (hardcopy mislaid somewhere en route) makes no mention of these. What a relief! I feared that Consonance would claim acoustic bennies. The infinitely arrangeable baubles look neat in a trompe loeil sort of way. "Great Caesars ghost, man, theres water all over your CD player!" I suspect that the massive aluminum top upon which the ersatz moisture is intended to twinkle, and the 3.75"-thick wood base beneath, are as much matters of statement as function. As a defense against resonance and vibration, the mixed-materials mass must surely do the job, as does the beefy lid that caps the transport well. Against this Droplet an umbrella availeth not. The Droplet employs two Sovtek 6H30 tubes. If it amuses you to experiment with different tube brands, belay the thought. From the manual: "Opening of the product by non-authorized personnel will void the guarantee," and theres no way to change tubes without opening the product. While some circuits are easier on tubes than others, if you play the game according to Hoyle, eventually youd have to take the Droplet to the dealer from which you bought it. Or maybe not. The distributor assures me that its possible to have the dealer talk the customer through a tube change. He estimates a 5000-hour tube life. I gave the player an afternoons burn-in. After a few hours, the aluminum slab became moderately warm to the touch, as had the transport well. However, the tubes didnt throw off nearly enough heat to do a disc harm. Theres no standby status. The Droplets on or off. A designer doesnt opt for tubes for the pleasure of the golden glow, which, in the Droplet, is mostly concealed. I couldnt easily describe the sonic character of the Aurum Integris CDP, through which I heard the music largely absent extraneous contributions -- as close, by my measure, as a component can get to the ideal. However, many audiophiles cherish tubes for the character they provide. If youre among this demographic, youll likely relish the Droplets hint of effervescent butterscotch. Familiarity breeds confidence: I played many of the CDs I used to evaluate the Integris. The first of the endearing qualities I noticed was the Droplets low end: beguilingly rich, with a bloom that in no way fudged pace. Bradley Jones plucked double bass on Flamingos [hatOLOGY 609] descended from Mount Olympus. With Anne Sophie Mutter Modern [Deutsche Grammophon 445 487-2], the solo violin glittered in a spacious, well-defined soundfield. Recording after recording, orchestral and solo strings shared this attractive sheen. However, in playing again Mendelssohns Hebrides Overture [London 443 578-2], I detected a touch of congestion in the tuttis. Its grossly unfair to compare a $3000 player to one that costs $10,800. Its even worse to compare apples with pomegranates. Nevertheless, in terms of what Im accustomed to and prefer, those 6H30 tubes set the Droplet apart. Brothers and sisters, peace! Now! Lets agree that rational, discerning audiophiles are at liberty to favor certain styles of sound without incurring Gods wrath or their contemporaries scorn. This means looking beyond sounds that are merely undistorted -- that is, dynamically, harmonically, timbrally, and spatially accurate -- to sounds with personalities. An audio maven of my acquaintance, a stone tubenik, found the Aurum Integris bland and uninvolving. Ive thought about this and have concluded that while he and I were responding to the same qualities, I value what he perceived as "boring" as being exquisitely transparent to the source. Which of us is right? Questions like this bring people with similar interests to an unnecessary impasse. The Droplet, with its mellow attractions, is not my cup of nectar. Be that as it may, in my system the player sounded best going through the preamp. Those of you with preamps need not worry about a duplication of function. Setting the Droplets volume to maximum will likely give your preamp more than adequate volume flexibility. With the Droplet thus connected, I again played that Mendelssohn overture in which Id detected that smidgen of congestion. I didnt hear it this time. The Auryn Quartets strings projected an endearing glow in the first of Beethovens "Rasumovsky" Quartets [Tacet 125]. What I failed to hear was that ultimate degree of resolution, which was also the case with Hugo Wolfs Italienisches Liederbuch with soprano Dawn Upshaw, baritone Olaf Bär, and pianist Helmut Deutsch [EMI Classics 5 55618 2]. On the upside, both voices sounded gorgeously plummy. The Droplets mellow qualities shone particularly well with a smooth-jazz release, As It Grows, with Russ Lossing (piano), Ed Schuller (double bass), and Paul Motian (drums) [hatOLOGY 605]. Conversely, Jan Dismas Zelenkas wonderfully complex Trio Sonatas for oboes, violin, bassoon, double bass, lute, and harpsichord [Heinz Holliger et al., ECM New Series 1671/1672] lost enough of their elegantly detailed impact to permit my attention to wander. And in conclusion . . . The Opera Consonance Droplet is a player with a sound -- a slant, a character, an unambiguous personality. The sound is beautifully rounded, giving the human voice a particularly fetching edge. Strings, as noted, exhibit a luscious sheen, brass an authoritative bite. As, for me, a problem, I see these qualities as contributions, which is to say, not strictly the property of the recording being played. Further, the attractions occur at resolutions expense. Diminished resolution is most easily perceived in dynamic subtleties and a sense of air, two areas in which I find the Droplet wanting. Im a bug for resolution. However, ones preference for this quality over all others is in no way universal. Again, as mentioned, those who value what tubes impose on playback will probably love the Droplet. And rightly so. Why should fellow enthusiasts squabble over matters of taste? Ive had too many heart-to-hearts with music lovers and audiophiles (sometimes theyre even the same person) to suppose for a moment that mine is the only opinion that counts. So heres a summation at which no one can snipe: the Droplets tubes make the difference. If tubes ring your bell, the Droplet may be the player for you, with or without the trompe loeil baubles. If youve a sound system with nary a tube in or out of sight and you think you might enjoy those widely celebrated qualities vacuum tubes impart, heres as good a start as any. And for all you aesthetes out there, two takes on the players sinuous looks. We had houseguests recently, husband and wife, both architects, he a fellow of the American Institute of Architects, a man of taste and probity, whom the Droplets appearance delighted. Me? I couldnt get it back in its shipping carton fast enough. De gustibus non est disputandum, as always. Beyond opinion are the players eccentric contour, weight, and size. The latter aspect, especially, seems to me excessive. The potential buyer who houses his or her components on shelves should check for dimensions.